Eric Johnson Exploration Technologies (EJX) Condor 9 FT (Full Thrust) Lifter! Condor 9 FT is a carrier rocket developed by EJX, or Eric Johnson Exploration Technologies! Condor is unique in it’s design in that it is a first stage RTLS (Return to Launch Site) boost back lifter! It is able to push the upper stage high enough, separate, turn back towards the launch site, fire it’s engines again and land! The first stage is equipped with KrakenTech™ heavy duty landing legs for landing back on land or a ship in the ocean! ** In reusable mode, Condor 9 is capable of lofting 9 tons of payload into LKO and 4.5 tons to KTO. In expendable mode it is capable of lofting 12 tons to LKO and 9 tons to KTO. These metrics classify it as a light duty lifter by the EJSA, but it makes up for that in re usability! 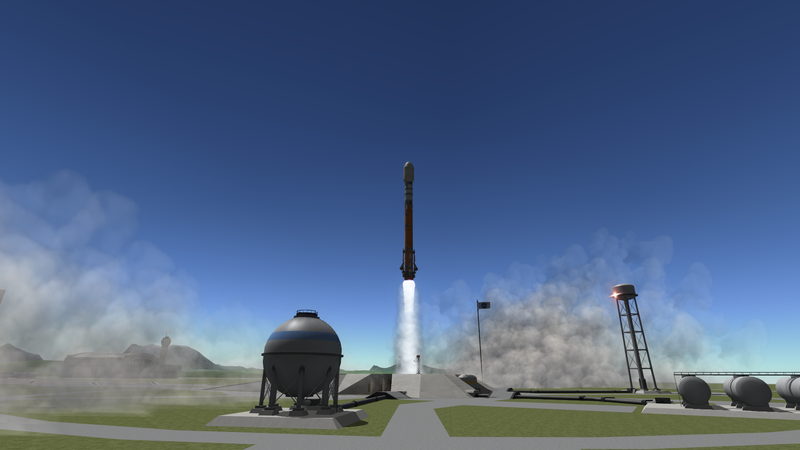 NOTE: Condor 9 is a tough lifter to fly, it requires more experienced KSP players to get the first stage back and put the payload into orbit, and your results will certainly vary from mine. You’ve been warned. Forward: Because Condor is reusable, it requires somewhat of a different ascent profile to utilize the first stage RTLS. You’re going to have to slightly change how you fly rockets into orbit with this one if you’re playing vanilla KSP, but it’s not that bad. Because Spacecraft in KSP ‘crash’ when they’re not being controlled by the player and go below 20KM, you have to ignite the upper stage at MECO, deploy the fairing and SWITCH BACK TO THE FIRST STAGE. This is important or else the game will think the first stage is debris and delete it if you go too far away from it! Fly the rocket straight up and begin your gravity turn at 8KM. DO NOT PITCH OVER FAST! The rocket can be wobbly if you turn to quickly. Utilizing a slow turn, at around 23KM the stack should be at a +60 degree AoA. Shut down the main engines when there is 1000 Units of liquid fuel left in the first stage. You need this fuel to turn around! Separate the upper stage and payload from the first stage. Ignite the upper stage engine, the engine will fry the docking port that it is attached to and it will explode. This is normal, the docking ports are used as a decoupler so the first stage could be reused again. STEP 3: Ghost ride the Stage! After separation and upper stage ignition, you should be hovering around 38-43KM depending on your ascent. Deploy the fairing at this time. Once the fairing is clear, you quickly need to point your upper stage at +27.5 degrees AoA. Once the stage is pointed at this vector, SWITCH BACK TO THE FIRST STAGE! You can do this using the ‘[’ and ‘]’ keys. The upper stage will continue on it’s path by itself for the time being, you’ll switch back to it after you land the first stage. Now that you have switched back to the first stage, hit action groups 7 and 8. These will shut down all unnecessary engines. (Only the center engine should be on.) using the RCS, turn the rocket heading 270 degrees on the compass at 0 degrees AoA and start your burn. You should have 1,000 units of fuel to work with. Burn till you have around 400-450 units of fuel left, or until your satisfied with your return trajectory. This part is extremely variable, you’re going to have to test your boost back burns to your liking, because no ascent is the same unless your using KoS or Mechjeb. What ever you do, DO NOT USE MORE THAT 350 UNITS OF FUEL. You need this for landing the rocket! Step 5: Steering the first stage back and landing! If all is well at this point, good job! You can use action group 0 to open up the air brakes to slow down while your coming back. The air brakes also conceal a flight control surface that you can use to help steer the rocket in the direction you want. 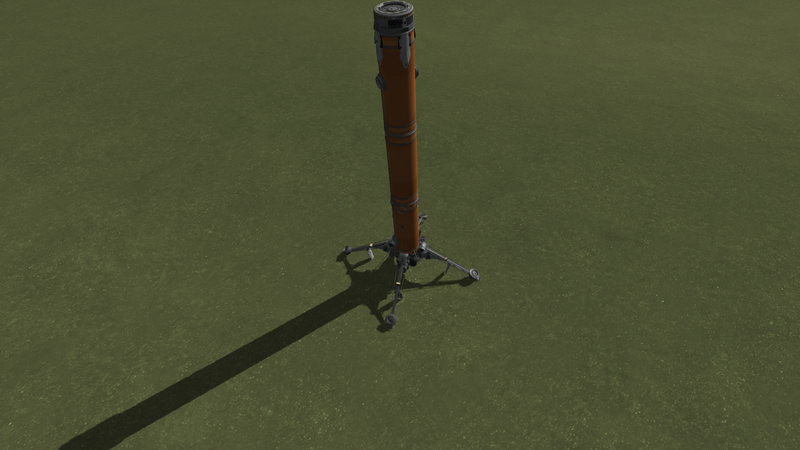 RCS can also be used to steer the rocket down. Now it’s time to land! Condor can use 3 engines to land if needed, but you only need one for now. At an altitude of 1500m you should be going around 160m/s, this is where you re-start your main engine and use the last bits of fuel to land the stage! The stage will start decelerating and should naturally be almost completely upright half way through the burn. When your velocity dips below 60 m/s, hit action group 9 to deploy the landing legs. Make sure the rocket is 100% vertical or the legs won’t deploy in time! The landing is very tricky to get because KSP has a game mechanic when two ships dock to each other, it puts all engines throttle to 0%. As the landing legs fall into position and latch to their lower docking ports, KSP will shut down your main engine. Keep spamming the ‘Z’ key during the latching process to make sure the game doesn’t shut your engine off! Once all 4 legs are in position, you should have around 100 units of fuel left. Use the last bits of fuel to gently land the stage down on the terrain below! If you have done everything right up to this point, CONGRATS! You landed that sucker! Good Work! Hit 6 to deploy the stowing mechanism, (This will make it so you can change scenes without the rocket blowing up!) Pause the game for a second to celebrate because you are NOT finished yet! The reason to pause the game is because your second stage is still suborbital! You need to switch back to it RIGHT WHEN YOU LAND or else it is going to re-enter! Step 6: Upper Stage Circularization! Once your done celebrating landing the first stage because your an awesome person, you quickly need to switch to the upper stage! Go to map view and right click on your stage! Hit the ‘Switch to’ button, and the game should load it up. Condor’s upper stage is equipped with a segmented fuel tank, to allow auto shutdown of the engine at a certain AP so the stage doesn’t shoot off uncontrollably into the abyss. When the game loads up the second stage, you need to select the stage’s secondary fuel tank and open it up! The engine should re-ignite and you should be on your way to getting to orbit! Remember to angle the upper stage to you don’t fall too far back into the atmosphere! If all has gone to plan you should have 20-80 units of fuel left in the upper stage and in orbit! Separate your payload and marvel at the winning that just occured!